Purchase the book for $19.48 or download your own copy of the e-book for FREE. "This volume teaches again and again one vital insight: peacebuilding in deeply divided communities requires a special combination of radical thinking, creative imagination and engaged action." "These stories and essays intimately and powerfully convey two fundamental truths. The first is that history changes only through the actions of people who decide it has to change… The second truth is that the human spirit is worth struggling for, day after day, year after year, no matter whether we are successful or not. In this work, which joins us at the heart, we will always find joy, even in the harshest of external circumstances." 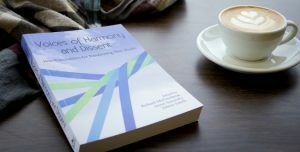 "Voices of Harmony and Dissent holds the heart of how social change happens–people who believe deeply, develop significant relationships, and have the courage to engage together. Each and every chapter provides lessons and inspiration and, most importantly, has a deep resonance that rises from these voices of hard-won experience and reflective practice, an authenticity that touches the reader and points us toward the kind of learning that really makes a difference in our world." "Simply wringing your hands over the state of the world is not going to change anything. It's real action that changes the world, and this book gives the reader advice from people who wake up every day and do the hard work of building peace. Bravo!" "This book is an empowering patchwork of rich voices of harmony and dissent… It is a book you can dip into here and there on a plane or before bed. This is because it is a compilation that lets the journey be your own in connecting up the many strands of wisdom it contains. All of us can be much better peacebuilders if we take that journey of the connections with this sumptuous volume."